Mario Gómez finished the 2010/11 season as the Bundesliga’s top scorer with 28 goals in 32 appearances. Per 90 minutes he scored 1.03 goals, or put another way he scored a goal every 87 minutes he was on the pitch. In the top European leagues only Cristiano Ronaldo (40) and Lionel Messi (31) scored more goals than he did (Antonio Di Natale equaled his tally of 28). In this post I take a closer look at his shooting and goal scoring using statistics gathered from the official Bundesliga website. In total Gómez took 95 shots or 3.50 per 90 minutes. Of those 48 were on target, 26 off target, 16 were blocked, 3 hit the post and 2 hit the crossbar. The majority of his shots, 79, came from open play. 2 came from penalty kicks, 4 from counter attacks, 4 from corners, 1 from a throw-in and 5 from free kick crosses. One of Gómez’s strengths is his ability to score goals with either foot or his head. With his right foot he scored 13 goals from 49 shots, with his left 9 goals from 24 shots and with his head 6 goals from 21 headers. His goals-to-shot ratios were very good with all three; 0.27 with his right foot, 0.37 with his left and 0.29 with his head. 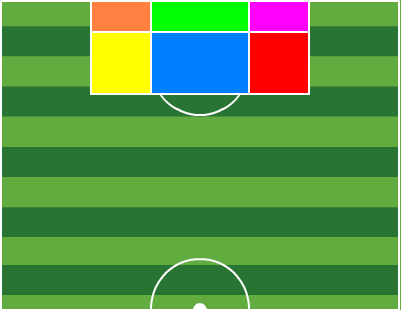 To see where his shots came from I divided the pitch into seven sections: Six Yard Left (orange), Six Yard Middle (green), Six Yard Right (purple), Penalty Left (yellow), Penalty Middle (blue), Penalty Right (red) and Outside Area. Gómez is a real penalty box predator; only 5 of his shots came from outside the area. 51 of his shots (53 if you count the two penalty kicks) came from Penalty Middle and 19 from Six Yard Middle, so altogether 75.8% of his shots came from directly in front of the goal. His other shots came primarily from Penalty Left and Right, 9 and 7 respectively, with 1 each from Six Yard Left and Right. Given most of his shots come from directly in front of the goal it’s no surprise most of his goals do as well. 14 of his goals were scored from Six Yard Middle and 11 from Penalty Middle. 2 were scored from Penalty Right and 1 from the penalty spot. His goals-to-shot ratios from Penalty Middle and Six Yard Middle were 0.22 and 0.74 respectively. Gómez tends to favour his left side when aiming his shots. Of the 48 shots that were on target 18 were aimed at the left third of the goal, 23 at the center third and 7 at the right third. Of the shots that were off target to the side of the goal 10 went to the left and 6 to the right. He hit the left post twice and the right post once. In total he shot to his left more than twice as often as to his right; 38.0% to his left versus 17.7% to his right. When choosing the height of his shot his range was more balanced. 27 (34.2%) of his shots were aimed high (the top third of the goal and everything off target above the goal), 19 (24.0%) to the middle third and wide on either side and 33 (41.8%) to the bottom third and wide on either side. In the following table I have summarised the destinations of all of his shots on target. I split the goal into nine sectors – top left, center, right, middle left, center, right, bottom left, center, right – and listed how many shots ended up in each sector and how many goals those shots resulted in. The bottom sectors were the most productive for him with 18 of his 28 goals coming from there. The left side of the goal was more productive than the right with 11 goals scored to his left versus 6 to his right. To any Bundesliga goalkeepers reading this I would offer a suggestion: the next time you come up against Gómez and he is about to shoot stay low and get ready to dive to your right. Whatever you do don’t dive to your left. Finally, what would this post be without a video of Gómez in action, so here is a video of all his goals from this season, including not just his 28 Bundesliga goals but also his goals from other competitions. Thanks to jackmcrobert for the video. Interesting read. Where did you get the data? Are they freely available? The data is from the official Bundesliga website: http://www.bundesliga.de/de/index.php. For some reason they have an agreement with Opta that allows them to release all this wonderful data free to the public. To get to the data, at the top of the page hover over Bundesliga, then click Spieltag & Spielplan, then choose a match day, then choose a match and click on Matrix. Then choose the player(s) from the left hand side and the actions from the right. It’s all in German but not hard to figure out using Google Translate. Then it’s just a matter of going through every match to collect the data that you want.